It wasn’t many years ago when people would deride our media with the question: What are you guys doing at the Olympics when your country can’t even compete, let alone win a medal? A nation whose obsession with and achievements in cricket are only too well documented, was still far away from being a powerhouse in Olympic sports. Countries with one hundredth of our population and very poor economic growths were doing better than us. But when the nation witnessed a Tricolour-draped Rajyavardhan Singh Rathore (Now, The Honourable Sports Minister Of India) standing on the podium wearing the silver medal at the Athens Olympics, we knew we were entering a new era. And that was it, the celebrations were just getting started. Abhinav Bindra soon became the first individual to win a gold medal at the Olympics, followed by a double medal winning feat by wrestler Sushil Kumar, and boxer Vijender Singh, lending stature and glamour to the sport of boxing with a bronze. The year 2012 was a golden year for India, though a gold medal eluded them. Still, two silvers, Sushil Kumar’s second medal and shooter Vijay Kumar’s achievements combined well with the bronze of Gagan Narang, wrestler Yogeshwar Dutt, badminton star Saina Nehwal and woman boxer Mary Kom, gave India its richest medal haul at one Games. In badminton Saina became the number 1 player in the world, with the extremely talented and young PVS Sindhu showing potential at the world stage. In a real sense, one man who has epitomised success for India is chess master Viswanathan Anand, who remained a world champion till Magnus Carlsen dethroned him in Chennai. Add to these the Grand Slam doubles victories of Mahesh Bhupathi and Leander Paes and the achievements of golfers like Jeev Milkha Singh and Arjun Atwal, and you can safely say that India was coming out of the one-sport nation mould. It’s only fair to claim that it’s these seeds of perseverance of the athletes that has yielded the fruits of huge success in various sporting events. Today India is looked with much greater respect as compared 10 years ago. The laurels of the highest stature earned by the young brigade like Saina Nehwal, P.V.Sindhu, Abhinav Bindra, Sania Mirza, etc. speak something positive in their favor and led to inspiring the common man to take sports as a career, apart from their leisure routine. Due credit must also be given to the social and electronic media which has played a important role. Increased awareness led to the common man who was once confined to small past time sports in villages and cricket in cities to move forward to give other sports a serious thought with the government’s backed initiatives. We had SAI (SPORTS AUTHORITY OF INDIA) the biggest government undertaking honing the young aspirants in various disciplines for them to convert performance into excellence at every level. While various private organisations and corporates too embarked upon their journey of providing athletes an easy access to facilities for them to step on the winning podium. 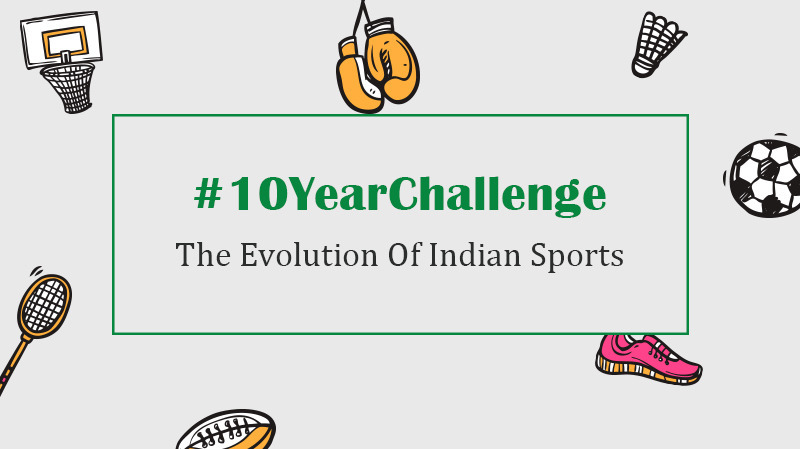 Apart from this, the influx of various sporting leagues such as Indian Premier League, Hockey India League, Pro Kabaddi League and Indian Super League, Indian Wrestling League, Indian Badminton league, etc. played a HUGE role in building the tempo. These tournaments have registered a huge fan following with women contributing at large. Not just fan following these homemakers are justifying their worth in various sports by achieving top honors. With 675 million Indians having access to television, awareness and viewership of sports have increased. Sponsorships to this healthy medium have also increased by 19.33%, touching the Rs.6400 crore mark. It is thus becoming the next big industry in India by contributing towards the sizeable amount of employment. If the associated businesses such as sports manufacturing, retail, tourism, sports medicines, sports facility & infrastructure, media & hospitality are included then the industry worth in India is whopping USD 100 Billions. From being 43.7 billion worth industry in 2013 to 48 billion in 2015, India has moved forward from being a single sport nation to a multi-sport country. It is witnessing a boom that will benefit the sports business in the years to come.